When performance matters the Viper Series 400 Watt UV Sterilizer delivers the highest UV outputs and flow rates at a fraction of the size. The Viper Series is designed for maximum performance, power, and reliability. The Viper series replaces multiple lamp units with a single high output lamp reducing space required for installation. Ultraviolet is a proven dependable and effective method of controlling algae and harmful bacteria without leaving any residuals in the water. Aqua Ultraviolet utilizes the highest quality components designed to work perfectly together maximizing kill rates and ensuring ease of installation and maintenance. Performance Matters! 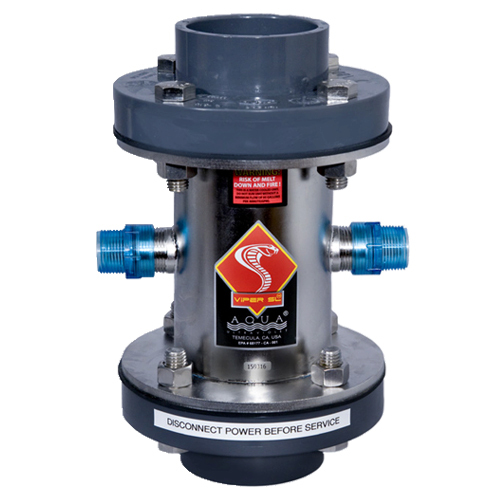 The Viper Series is the smallest, most powerful and lowest flow loss UV. No other UV comes close! The Viper delivers the clearest and healthiest water at awesome flow rates. California residents will be charged 7 3/4% sales tax.